For all I have a stash of beauty products large enough to open a small retail store, there comes a point in my life where I just can’t resist repurchasing some of my favourites. This time, it was a perfume that I just cannot be without and two of the best make up removing products I’ve tried from top skincare brand Klorane. I bought all of these from Escentual and got some great deals (1/3 off French pharmacy brands in October and the fragrance is cheaper than elsewhere anyway!). 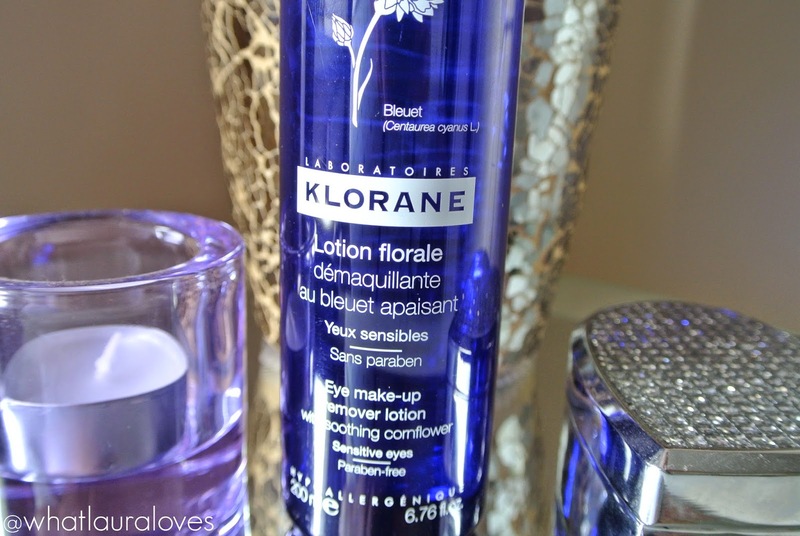 The first product that I repurchased was the Klorane Eye Make Up Remover Lotion. I have been using this for years and years and it is the only eye make up remover that I have ever repurchased because, in my eyes, it is the best out there. I have tried quite a number of eye make up removers in the past and what I have found is that I am not a fan of bi-phase solutions where they have a high oil content and you have to shake the bottle to get the two liquids to mix together. I hate the feeling that they have on my eyes and they leave an awful residue that tends to irritate them and make my skin feel awful. 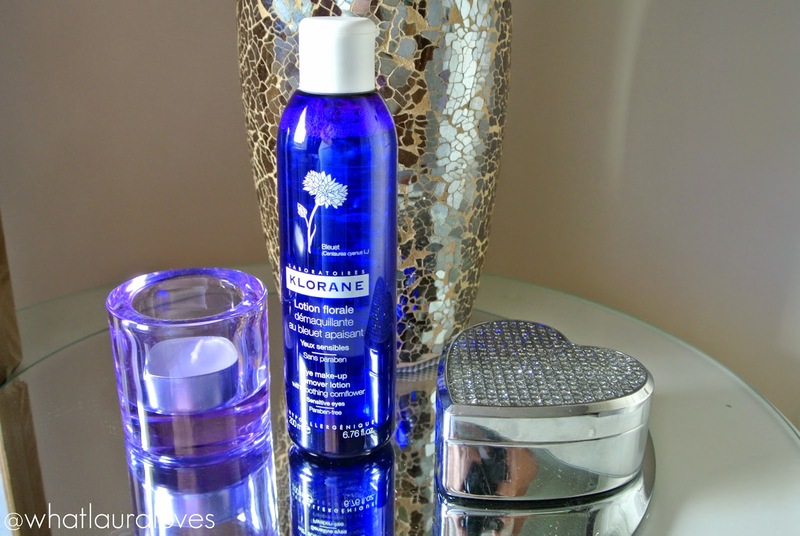 Since I discovered the Klorane eye make up remover many years ago, I haven’t looked back and while I’ve tried other removers since, they have all been samples or freebies when buying other products, as this is the only eye make up remover I will repurchase now. What I love about it is how gentle but effective the formula is. It doesn’t feel oily in the slightest. I pour a little onto a cotton pad, the remover has a blue tint to it so you can see exactly how much you’ve applied so as not to waste any, and then I hold it over my closed eyes for a few seconds and then wipe away the make up. It is effortless and doesn’t tug at my eyes at all. I particularly like using this make up remover after a night out as it removes pigments, liquid liner, waterproof mascara and lash glue with complete ease. Considering it has a very mild formula with soothing cornflower, it is incredibly effective and removes all of my eye make up in an instant without irritating my eyes or making them sting. French cornflower has softening and anti-inflammatory properties and Klorane harvest it during full blossom before frying it out in special clay ovens which means that the cornflower water that is subsequently distilled from the flowers has all of the active ingredients and purity still in tact. It has a pH that is similar to that of tears which is what makes it so mild that you can use it without irritating your eyes. It s suitable for those who wear contact lens’ too so if you’re a lens wearer then give this a go. Klorane have repackaged their eye make up remover into more of a slender bottle. I like the new packaging, although there was nothing to dislike about the previous packaging either. You can see my full review of this eye make up remover from many moons ago in this post although my opinion has only grown stronger towards the product from then to now. The eye make up remover is available in a 100ml and a 200ml bottle like the one I have. It is available to buy here and here. 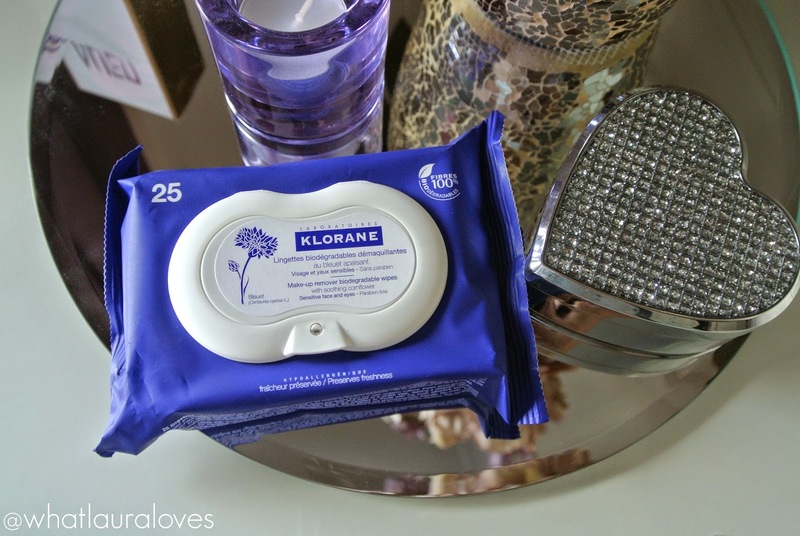 The other Klorane product that I repurchased were the Klorane Make Up Remover Wipes. I actually received a sample of these to review a couple of months ago but I used them up before I could even get my camera out to snap a photo of them; I loved them that much! These are a very quick and easy way to remove the vast majority of the make up from your face before heading into the bathroom for a thorough cleanse. They’re very moist wipes so they don’t tug at my skin whatsoever and the solution that is on the wipes is very effective indeed. Like with the eye make up remover lotion, these wipes contain the same French cornflower water, making them very gentle and non irritating on the skin. While I wouldn’t suggest make up remover wipes as your only method of cleansing your skin, I think that they’re great at getting your make up off before cleaning your skin with a cream cleanser, for refreshing your skin on a morning or for taking with you onto aeroplanes, to festivals, camping and any other home away from home. These are the best wipes I’ve found to date as they’re very moist, great at breaking down dirt and make up and they come in a packet with a proper lid that helps to prevent them from drying out. 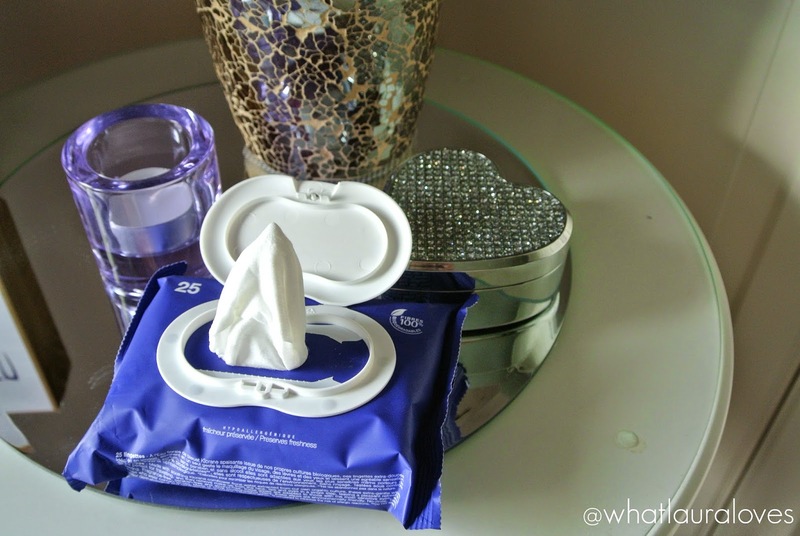 The Klorane Make Up Remover Wipes are available here in packs of 25. They are also available from John Lewis. 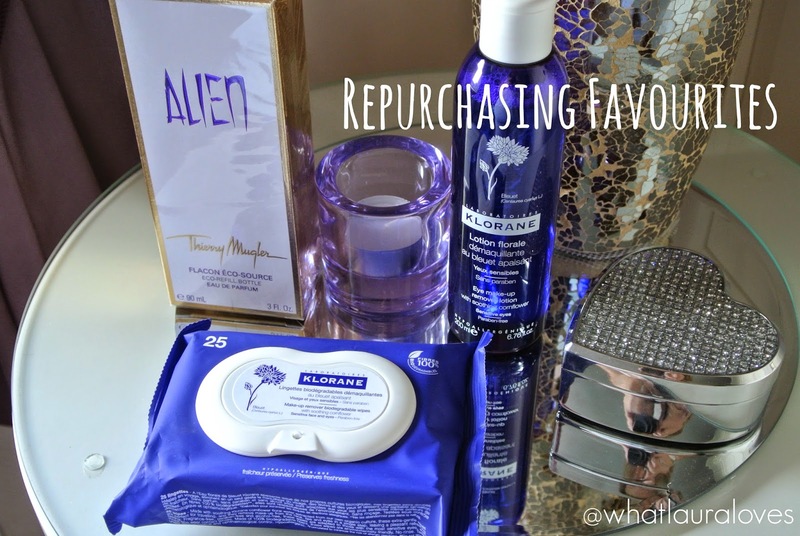 The last favourite that I repurchased was the Thierry Mugler Alien Eau de Parfum Eco-Refill Bottle. 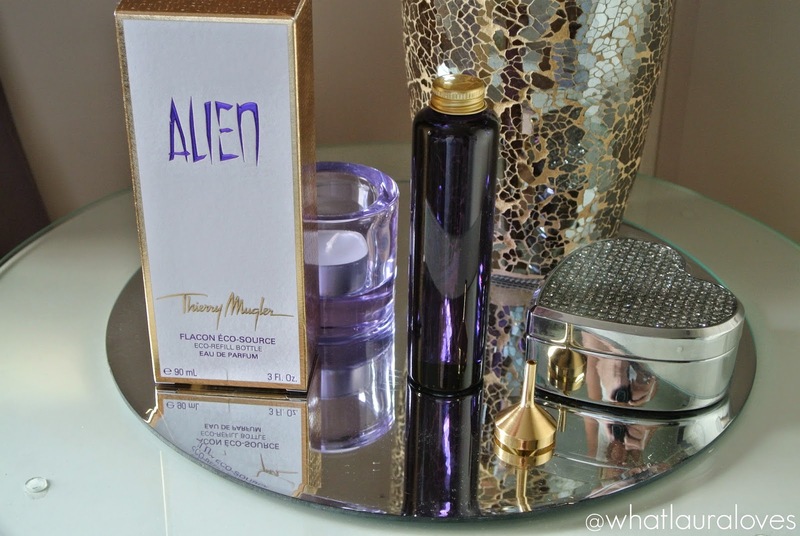 Alien is one of my most loved fragrances and I have worn and repurchases it for years and years. The scent is sensual, exotic, very mysterious and different to anything else I have ever smelt before. It is very distinctive and once you know what Alien smells like, you’ll be able to recognise it instantly on others. I do find that this is a scent that smells different on different people so I think it is one to try in store before buying it blind online. When you purchase Alien, you’re able to buy a refillable spray bottle that comes with the perfume inside, then when you run out you can take it along to a refill stand from certain stores (theres one in the House of Fraser where I live) or buy one of these refill bottles to top it up yourself. These are the new echo ones that are in slightly cheaper packaging than the other type of refill bottles but that doesn’t matter at all as you’re not going to be keeping it on your dresser once you refill your gorgeous Alien bottle. Refilling the bottle is easy, I have done it many times before. The box containing the refill bottle also comes with a handy funnel so it enables the perfume to be poured into the Alien bottle with next to no spillage depending on how steady your hand it. I can’t wait to refill my bottle and start wearing this scent again. I have definitely missed it! The 60ml refill and the 90ml refill bottle like I have are available here and here. What favourites have you repurchased recently?